An old male bald gnome with quite an impressive white beard. 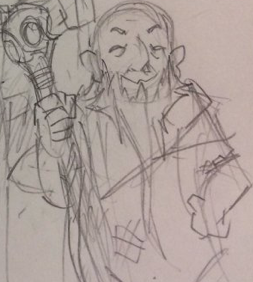 Wears what looks to be dirty rags, carries quite an expensive looking staff and has wooden planks tied to his feet with leather straps that work as makeshift shoes. Krix doesn’t seem to be all there. He talks in a shrill voice and doesn’t seem to take anything seriously. He also isn’t above hitting people with his staff when they annoy him. He’s generally very friendly if a little eccentric. Krix, or Chren, as his friends call him, is a very old very strange gnome. Naella told our adventurer’s that they had met Krix after they were ambushed. Krix helped nurse them back to health but for his help, his home in the woodlands was raided and burned down. With nowhere else to go, Krix followed the girls and now spends his days adventuring with him. After the party meets up with Naella’s group again, they learn that Krix died defending his friends.